Editor/Author Sivamani, Raja K., Jagdeo, Jared R. and Elsner, Peter, et.al. 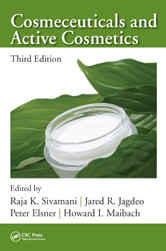 This third edition provides ample evidence on specific cosmeceutical substances, their classes of use, skin conditions for which they are used, and points of interest arising from other considerations, such as toxicology and manufacturing. The book discusses both cosmetic and therapeutic uses of cosmeceuticals for various conditions including rosacea, dry skin, alopecia, eczema, seborrheic dermatitis, purpura, and vitiligo.